This was published in the Arts & Letters supplement of the Dhaka Tribune, a new English daily in Bangladesh, on July 7, 2013. You can read the Arts & Letters Supplements here. I remain preoccupied with Algeria. This spring when the police battled Jamaat supporters on the streets and war crimes opponents rallied at Shahbagh, a lot of easy talk began to fly around about civil war. Having witnessed 1971, I shuddered at the thought of Bangladesh plunged into another war. To imagine what such a war might look like, I searched for fiction that would bring me to ground level. Algeria came to mind. In the 1990s, the banning of Islamists triggered a war that led to the entire country living in daily peril, to the deaths of thousands, to many writers and artists choosing exile instead of death. My search led to a writer I had encountered once before: Yasmina Khadra. Three years ago I journeyed to an artists residency in Montana to work on my novel. I was in a tiny town, 6000 miles high in the mountains, the nearest bookshop thirty miles away. With reading my only entertainment, I treasured the books left behind by past residents. They included The Attack by Khadra where an Arab surgeon in Israel discovers his wife among the victims of a suicide bombing, only to be horrified when he realizes she was the perpetrator. 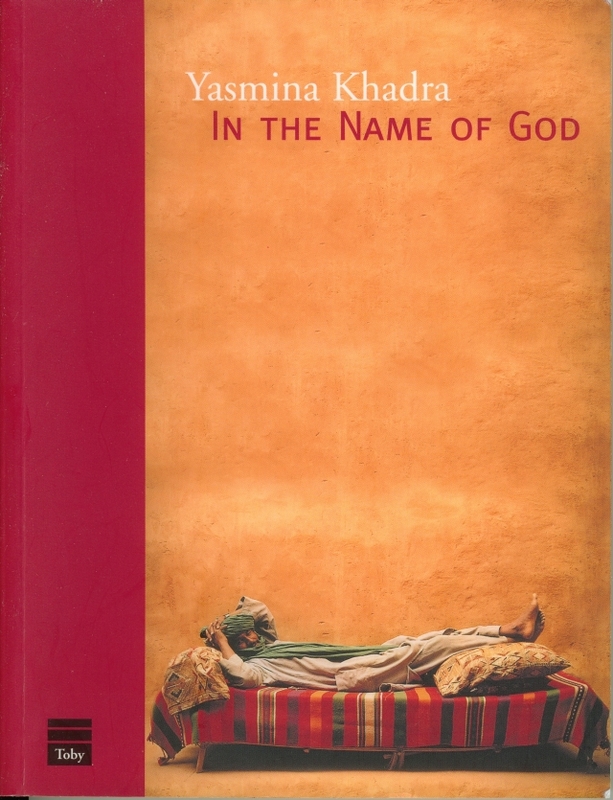 Yasmina Khadra is the pen name of Mohammed Moulessehoul. He had been an army officer for 36 years. When the military demanded to oversee his writing, he adopted a pseudonym made up from his wife’s names. Disturbed by the war, he moved to France and later revealed his identity. In his fiction, he explores the Algerian war, probes the psyche of fanaticism, and with incisive language plumbs the depths of Algerian society. I started with In the Name of God, translated by Linda Black, the French original published in 1998. It traces the descent of the village of Ghachimat into a cauldron of horror. It opens with three young men, friends from childhood. There is a bit of tension among them since all are attracted to the same girl, the mayor’s daughter. Other characters include Issa, a former collaborator with the French who lives with daily humiliation, his mechanic son Tej, the wily dwarf Zane, and Dactylo who writes letters for the public. After Sheikh Abbas returns from prison, self-proclaimed men of Allah begin to take control. Elders are manipulated and cast aside, the ruins of an ancient temple are destroyed, and those not on the ‘right path’ are slaughtered. In the hands of those with new-found power, below-the-surface resentments and jealousies get channeled into revenge. This bleak novel is certainly worth reading if you want to see what civil war might look like in a country like ours. For another taste, I hunted down one of Khadra’s crime novels featuring Superintendent Llob: Morituri translated by David Herman. I found myself in 1990s Algiers where Llob investigates the disappearance of the daughter of a city kingpin. Before long, both daylight and dark will make Llob tremble. Driving with him through Algiers, you can tell more will be revealed than simple binaries of good police and bad Islamist terrorists. With Llob we circulate in a fascinating world of repellent power brokers, weary policemen, drug dealers, pimps, and fanatics. Many dismiss crime novels as mere thrillers filled with plot twists. But there is no wall separating a mystery from a work of art. Khadra’s Llob novels, like those of other masters of the genre such as Jean-Claude Izzo or Raymond Chandler, are literary creations where puzzle solving is combined with richly evoked settings, memorable characters, and crafted language. I reflect on a soldier turned novelist and wonder why there are so few. In Bangladesh, I only know of one officer, Shabbir Ahsan, who published the novel The Peacekeeper. Of course there is also the general who fancied himself a poet, but the book memorably tied to his name is not his own but from one of his ex-wives: Bidisha’s Shotrur Shathe Boshobash. Given the high drama in our society – the startling crimes, the twisted intrigues – where is our fictional Superintendent Llob? I eagerly wait for the arrival of our own literary noir.